THE SHADOW CONSPIRACY X MASTER BLASTER PLANET EXCLUSIVE WOOD GRAIN COMPONENTS IN STOCK NOW! Limited edition 10 sets worldwide! We are super stoked to announce our newest Master Blaster Planet collaboration of 3 exclusive items in wood grain from The Shadow Conspiracy. Click HERE to view all three items. This project has been in the works for well over a year, and we couldn’t be more proud of the result! 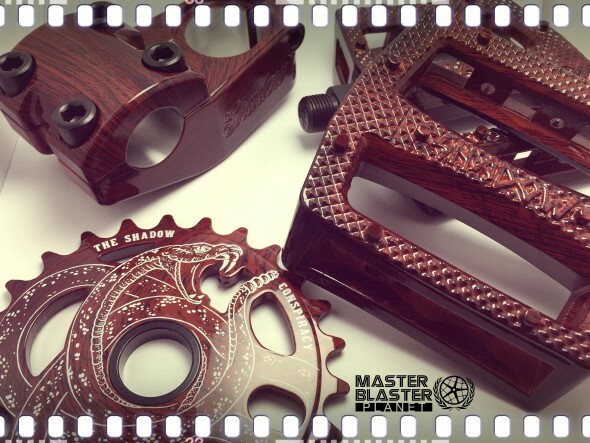 The Shadow Conspiracy Chula Upload top load stem, Serpent sprocket, and Ravager PC pedals are all featured in a dark brown wood grain color which is an exclusive at Master Blaster Planet. These items are super limited edition as only 10 of each component were released worldwide. You can purchase each item seperately, or you can purchase the entire kit for a reduced price of $125 including priority mail shipping (US only). Please CONTACT us for this offer. Limit 1 set per customer. « SUBROSA “EASY RIDER” Seats come in both Pivotal and Tripod styles… In stock now!